They were just tiny tots, less than 30 cm tall when added to our garden about four and a half years ago, but looking at them now, we’re absolutely pleased with their current status. This duo have matured marvelously over the years, almost 1.3 m tall and as wide, with strikingly big, bold and beautiful bipinnatifid foliage. A little restricted though being container-grown, otherwise these tropical beauties would definitely have been much larger and more spectacular as grounded garden specimens. Plant type: Ornamental semi-woody shrub that is native to Brazil, Bolivia, Argentina and Paraguay in Southern America. 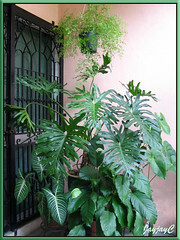 Features: Philodendron bipinnatifidum is one of the most well-known species of the large genus Philodendron, consisting of approximately 1000 species or more. 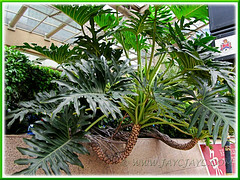 Belonging to the Meconostigma group within the genus that are collectively known as Tree Philodendron species, this tropical rainforest plant with tree-like base can reach incredible height and width (sometimes 7 x 7 m), especially in its natural environment, where it supports itself by climbing trees as an epiphyte, using its rope-like anchor roots to wrap around tree stems. In cultivation though, P. bipinnatifidum with a medium to fast growth rate, typically grows outdoors as a large semi-woody shrub between 2-4.6 m tall with an equal width, but much smaller as a potted houseplant indoors. It is popularly grown as an ornamental or landscape plant for its beautiful and glossy foliage with large bipinnatifid leaves of variable lengths, up to 90 cm long. The dark green leaves are deeply divided into many lobes with undulated margins and display prominent veins. They are held on long arching petioles (up to 1.5 m long) that are smooth and similarly colored as the leaves, emerging closely from the basal rhizome that gradually develops into an upright single tree-like trunk. The unbranched trunk with a thickness ranging from 6-15 cm in diameter may eventually bend or flop, being top-heavy or aged. It displays characteristic leaf scars created by the discarded discolored basal leaves and sends down to the ground numerous and tough aerial roots for support and to assist in transporting water and nutrients from the soil. Typical of an aroid, it produces an inflorescence, consisting of a greenish spathe enclosing a whitish spadix that bears the petalless flowers. Remarkably, the spathe is about 1 ft tall. Whatever, it rarely blooms if grown indoors. More notable and amazing is the flower’s ability to maintain a constant high temperature of 114 degrees F for the 2 days that it is opened, the only one of a kind on earth! Read more about the heat-producing Philodendron flower at UBC Botanical Garden Forums and UCC Biology Department. Be aware that the plant contains toxic calcium oxalate raphide crystals that upon ingestion may cause severe swelling and affects respiratory functions. 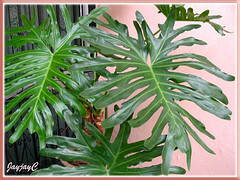 Culture (Care): Philodendron bipinnatifidum or P. selloum as it was previously and commonly known, is an easy-to-grow foliage plant that needs little attention, preferring the warm, humid and wet tropical conditions. Light: Grows best in dappled sunlight or bright filtered light. Can take full sun or partial shade but not deep shade. Moisture: Water moderately and regularly. Soil need to be kept evenly moist but not waterlogged. It enjoys humid and well-aerated conditions. Mist the plant regularly if air is very dry to provide adequate humidity. Soil: Grows best in a sandy loam medium that is humus or organic-enriched and can retain moisture, yet drains well. Nonetheless, it is not choosy about soil, any kind will do. Others: Remove discolored and withered leaves. Repot in larger container if too root-bound. Be extra careful when handling this plant as the sap may irritate sensitive skin and cause rashes, as well as stain clothing. Feed with a balanced liquid fertilizer fortnightly. No serious pests or diseases. For subtropical regions: Hardiness: USDA Zone 9 -11. 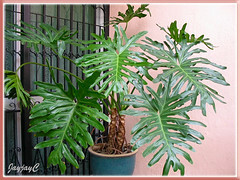 This is supposedly the hardiest of all philodendrons, though not frost-hardy, where frost or freeze may kill the leaves or whole plant to ground-level, but it will usually come back when warm weather returns in spring. Nonetheless, it’s best to give protection during winter freezes or overwinter indoors. Propagation: Easily propagate by division of offsets or suckers that sprout laterally from the root system of the parent plant and grow them individually as new plants. Can also be propagated from cuttings (check here), by tissue culture (mostly done commercially) or seeds which are rarely available, though one can learn how-to artificially pollinate the flowers to set seeds here. 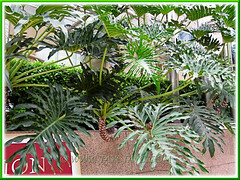 Usage: P. bipinnatifidum or Cut-leaf Philodendron make spectacular ornamental or landscape specimen shrub outdoors in gardens, parks and public places, especially where there’s spacious land area. Great as a filler plant for bare spots or in borders under tall trees. Excellent in containers as a patio or deck plant, or located at porches, entrances and courtyards as stand-alone specimen or amongst a crowd of low-growing foliage plants. Use it too as an impressive houseplant in homes or as a decorative interiorscape plant in public buildings, offices and lobbies or greenhouses. Hi there, wonderful site! I am not experienced with plants and have just been given a 40 yr old house plant from my father. It is a Philodendron bipinnatifidum (Tree Philodendron, Cut-Leaf/Split-Leaf Philodendron, Lacy Tree Philodendron, Selloum)… according to your website. This plant – given it’s age – has a very very long trunk and tons of vines growing off the trunk. 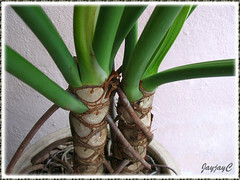 Due to the length of the trunk it is now growing almost horizontally. I was wondering if it is wise (or possible) to do some plant surgery – essentially hosing off the root ball and cutting half the trunk off (leaving many of the root vines growing from it) and replanting it so it sits upright. I love this plant but want it to sit upright. I also would feel horrible for killing the thing given how long my father had it. 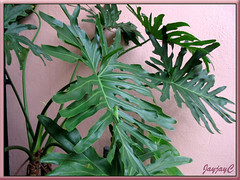 Hi Jacqueline I found your site when googling info on the reproduction of the philodendron selloum because our plant had the spathe that I’d never seen before. That being said, your site information and links were the most informative and I would like to thank you for your post. How lovely to discover its flower on your plant. We’ve never seen it before on our plants and would definitely hop over at your site to view it. something very unusual which we noticed about ours….. last week when removing a few lower leaves from our large plant, some of the liquid from the plant dripped on my left hand….. an immediate burning sensation happened and i noticed a very very distinct smell from the leaf where i had just removed it from the trunk. Any info on toxicity? or use in bush medicine situations. It is a serious burn which blistered up and is purple black just as if i has been burned with hot grease. Sorry to read of your severe encounter of its sap on your hand, Island Folks. Indeed this plant is toxic and poisonous and will cause skin irritation. Check out the external link on Wikipedia which I’ve provided in my article above on toxicity. Hope all’s well with your hand now. Take care. We’ve never tried propagating this plant, so unable to advise wisely. However, I’ve provided a link in my article above at sub-item ‘Propagation’… you may want to check that out as it provided good tips on propagating by cuttings. i got sap on me from this plant from removing a section of it at my sisters for her because it will grow uo and out of your yard . now i have a rash where ever the sap stuck to me and spreading . red little bumps that itch and oozing a too days afterwards. so do yourself a favor and if you get it on yourself remove it as quickly as possible with a solvent because its real sticky. I was given a pot of 2 Philodendron bipinnatifidums. The larger of the two plants stands ~ 55 inches tall and its think trunk has bent over from its own weight. I want to take it out of the pot in an effort to make the plant stand more upright. I have read one can cut the trunk but I’m not certain this would work for the potted plant. Unfortunately bringing the plant outdoors and letting it take it natural vining shape is not an option as I live hardiness Zone 6b: -5F to 0F. Any advice or how-to videos would be helpful. Thank you!